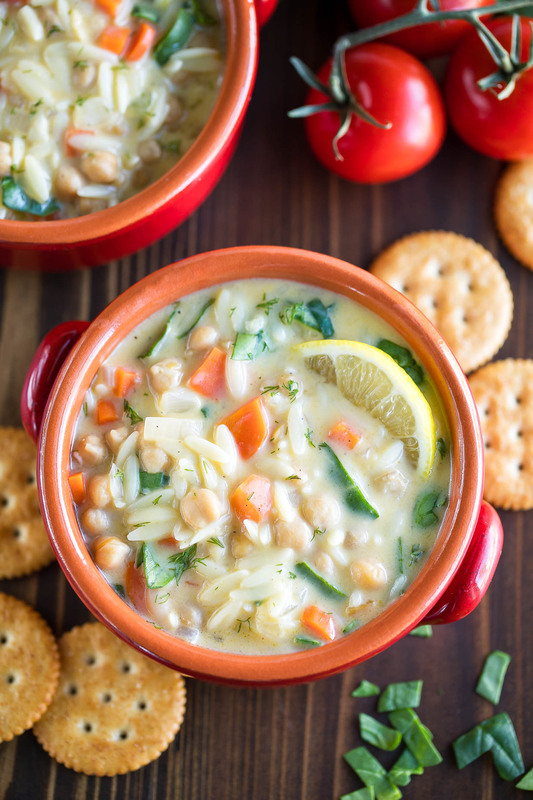 This comforting Chickpea Lemon Orzo Soup is lusciously creamy and made dairy-free with no cream at all! 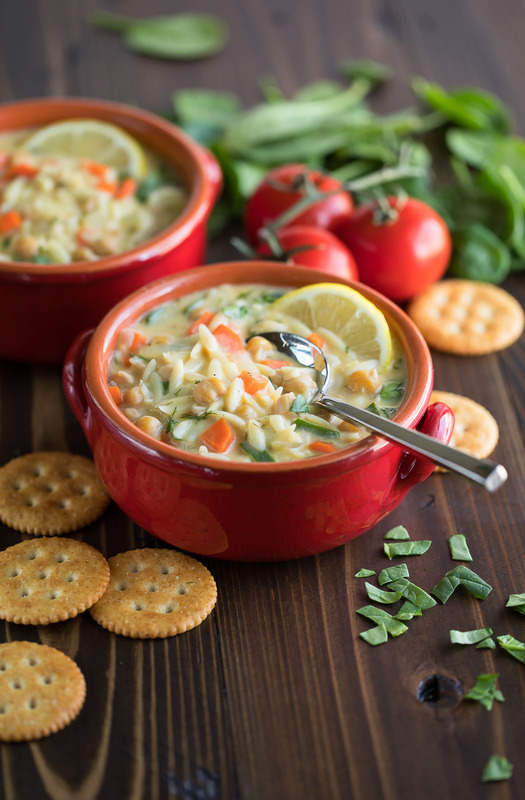 This healthy vegetarian soup is a new family favorite of ours and I can’t wait for you to try it! I have a wee bit of an obsession with adding chickpeas to my soup in place of meat. I sprinkle them on top of my butternut and tomato soups and swirl them into my spicy Moroccan sweet potato soup. They add fiber, texture, and protein, and are a great healthy addition to everything from soups to salads. Without a doubt, chickpeas are hands-down my favorite legume on the planet. I’ll forever be stuffing them in my face by the handful and spiking my recipes with them. So what are you waiting for? 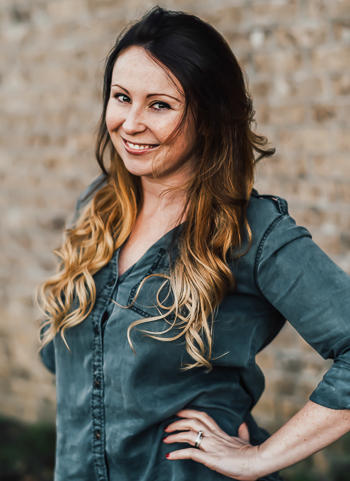 Grab some garbanzo beans and meet me in the kitchen! Today’s recipe as a creamy chicken noodle soup vibe but with chickpeas instead of chicken. It also has a lusciously creamy dairy-free base that we just can’t get enough of! I recently learned a tasty soup hack from Cooking Light where you combine eggs and lemon juice to make a cream-less cream sauce. The egg mixture is slowly heated with the addition of hot broth, then swirled into the soup for a lusciously creamy and velvety soup. It sounds a little crazy at first but since trying it, I’m 100% hooked! I made it for Paul when he had a whopping man-cold a few weeks ago and my picky eater gave this bowl-o-comfort an enthusiastic thumbs up. It’s already on the menu again for this week! Gluten-Free? You could totally try swapping the orzo for a long-grain rice like basmati or jasmine. Simply cook it up separate (so it doesn’t get gummy) via your favorite method and swirl it in at the end of the cooking process. No garbanzo beans? No problem! In place of the chickpeas you can use your favorite white beans. Cannellini beans would be awesome here! If you prefer to skip the legumes entirely, you can absolutely use extra veggies in place of the beans. 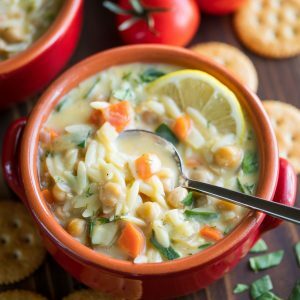 This comforting Chickpea Lemon Orzo Soup is lusciously creamy and silky but made dairy-free with no cream at all! This healthy vegetarian soup is a new family favorite of ours and I can't wait for you to try it! Prep those veggies! Dice your onion, peel and dice the carrots, and mince the garlic. Heat a large pot or dutch-oven over medium-high heat with your oil. Add carrots and onion and sauté until tender, approx. 8-10 min. Next add your minced garlic and chickpeas and sauté for an additional minute or so until fragrant. Pour in 6 cups of broth and bring to a boil. Add orzo and reduce heat to a medium simmer to cook the orzo, approx. 6-10 minutes then remove from heat. In a medium bowl, whisk together eggs and half the lemon juice. Dip a ladle into your soup and slowly (SO SO SLOWLY) add the hot soup into the egg mixture. Stir constantly while repeating this step 2-4 more times, or until your egg mixture is warmed up and gloriously creamy. If your eggs are added straight into the hot soup, you'll end up with scrambled eggs swirls throughout almost like an egg drop soup. To keep things smooth and creamy (with not scrambled eggs in sight!) go slooooow baby slow! Give your soup a few minutes to cool down a bit. Once it's ready, slowly incorporate your creamy eggs into the soup. Stick with the slow pace and gently whisk it into the soup. Season with salt, pepper, and as much or as little fresh dill as you'd like. Taste and adjust as needed, adding the remaining lemon juice if you're loving the citrus flavor. Swirl in your spinach and you're all set! Ready to eat? Spoon into bowls and dive on in! This soup is excellent as leftovers and can be thinned with extra broth as needed. Enjoy! I used 6 cups of broth for a thick and chunky pasta and veggie soup. Want a brothier soup? Feel free to add an extra cup or two of broth! Give it a taste and adjust lemon, dill, salt, and pepper to taste to make up for added liquid and you're good to go. Nutrition Facts below are estimated using an online recipe nutrition calculator. Sodium and nutrient values will differ based on adjustments made and choice of broth. Adjust as needed and enjoy! 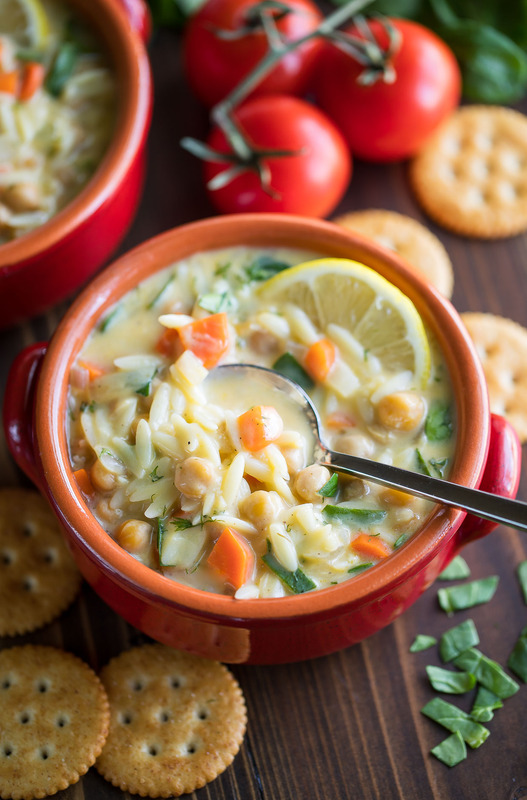 If you get a chance to try this chickpea-spiked lemon orzo soup, let me know! Leave some love in the comment form below or tag your photos with @peasandcrayons on Instagram so I can happy dance over your creation! I can’t wait to see what you whip up! I had a lonely celery bunch in my fridge and decided to add it to the soup and it turned out good. Most definitely making this soup again. And for those making the soup….do follow the directions about the slowly part for the eggs/lemon mix and hot soup. I became a little lazy at the end poured the last bit too fast and I did see a couple of egg curdles swimming around, but not much. Still a very delicious soup. I have been making the Greek chicken and lemon egg soup for over 40 years my husband is Greek so my mother in law shared her recipe. About 25 years ago i gave up eating meat so no more Greek soup for me. This recipe was so close to the soup I make for him it turned out delicious. Thank you so much. This is such a beautiful soup! I love that it’s packed full of protein from the chickpeas, but it’s a vegetarian option if using the vegetable broth. Thanks for this recipe. It’s a winner! I love everything about this soup! The flavors are totally spot on! So glad you’re loving it Wilhelmina. Thanks!